The below artworks are the most important by Nikolai Astrup - that both overview the major creative periods, and highlight the greatest achievements by the artist. Artwork description & Analysis: This is one of three paintings that Astrup created in his youth by painting upon fabric from used trousers, in all likelihood because he was struggling financially and unable to afford canvas (a seam from the trouser leg can be seen at the upper edge of the image). 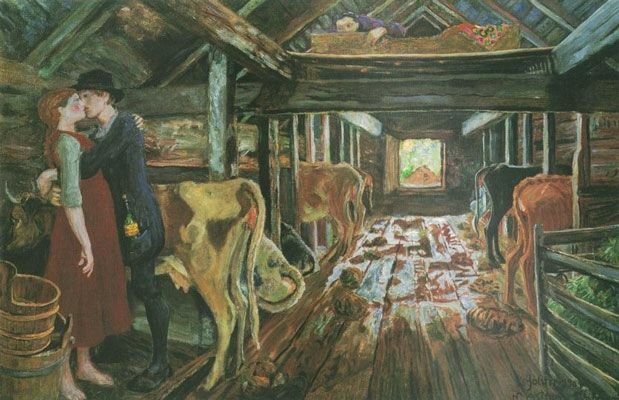 Artwork description & Analysis: In Cowshed Courting, we are given a deep-focus view down the corridor of a wooden barn that houses several cows. Occupying the left of the foreground is a young couple shown in a romantic clinch. The man, dressed in all black - boots, trousers, jacket, and hat, with a bottle of liquor poking out his jacket pocket (maybe it has given him Dutch-courage) - has both his arms wrapped around the girl who is barefoot and wears a green shirt, red dress, and a headscarf. The girl's right arm hang down by her side, but her left arm, draped round her suitor's shoulders, and her deep red blushing cheek, confirm her amorous emotions. At the upper center-right, a male figure laying in the hayloft is seen spying on the kissing couple. Through a window at the back of the barn, a peak can be seen and, beyond that, a glimpse of vibrant green foliage and clear blue skies. Here then, Astrup combines the theme of romantic love with the formal codes of Romanticism. The theme of passionate romance is obvious to us while the glimpse we are given of the outside world (through the barn window) shows a springtime landscape that belongs to the traditions of Romanticism. These features complement one another and rather foreshadow Astrup's own romantic fate, having fallen in love with a farm girl of his own (Engel) two years later. Artwork description & Analysis: This painting depicts a lush green landscape at the foot of a mountain. In the foreground, a small pond is speckled with waterlilies, and surrounded by vibrant green grass. Beyond this we see a field of yellow buttercups. Further back, a small cluster of log buildings indicates the presence of human life within this idyllic setting. In the background, mountains loom over the scene. Streams and waterfalls (Kleberfossen) can be seen on the nearer mountains, while the more distant, taller peaks are capped with snow. Astrup frequently re-used certain geographic locations as subjects in his works. For instance, this image depicts Ålhustunet in Jølster, and in fact the cluster of buildings (klyngetunet) shown here was perched just above the Ålhus vicarage where Astrup resided for a time. Several of his other works depict the same location. Astrup would modify the landscape by populating it with different figures, and by representing it under the effect of different weather conditions. He once said of a variation on this image "this picture I can almost not remember. One 'goes in circles' when painting so many variations of the same motif, even though one varies it each time and always returns to study nature." The buttercups in this twilight scene play an important role here since they do not close at sunset. They serve rather as points of light in the shadowy landscape. In fact, Astrup had to travel elsewhere to study buttercups as the marsh at Ålhustunet had been drained some years prior and thus the marsh-loving flowers had long since died out. The human figures in Astrup's landscape paintings were sometimes positioned in the distance and/or off to the side of the picture plane, as we see here with the two figures to the left of the cluster of buildings in this painting. They do not dominate or detract from the real protagonist of the image, the natural landscape. However, this painting includes a curious feature in the lower left quadrant: what seem to be vague shadows on the landscape reveal themselves to be silhouetted human forms. These forms are generally understood by historians to be a reference to Lørdagsfrieri (Saturday Night Courting) (1893) by Norwegian painter Halfdan Egedius, a painting in which two men walk through a misty field on a summer evening. 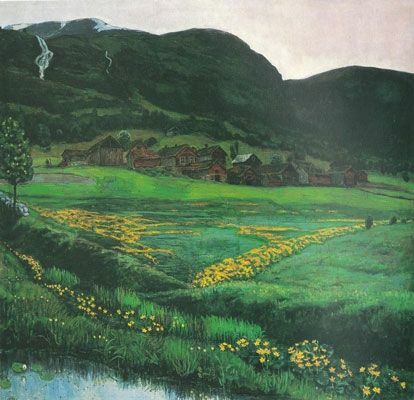 Egedius and Astrup had both been schooled by Harriet Backer, who's Landskap fra Ulvin (Landscape from Ulvin) (1889), is itself quite similar in form to her pupils' work. Artwork description & Analysis: In this vibrantly colored painting, a group of people sit in the grass at the edge of a large lake (known to be in Brenden), surrounding a large yellow-orange bonfire from which orange sparks and black smoke billow upward. Beyond the lake, tall, dark mountains loom in the background. Halfway up one of the mountains, another bonfire can be seen (probably either at Ålhus near Kleberfossen, or at Ålhusdalen), with its grey smoke rising into the sky. This painting serves as an example of the overall change of tone that can be noted in Astrup's oeuvre following his marriage to Engel. 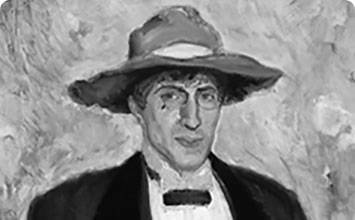 Engel was a significant inspiration and source of positive sentiments for Astrup, who wrote in a letter in 1909, "I cannot afford to lose her, I had almost given up hope in life when I met her, and thanks to her my life-force re-ignited." The Midsummer Eve bonfires depicted in this painting were part of pagan fertility celebrations and rituals dating back to ancient times. The figure nearest the fire is placing a juniper branch into the fire, which causes the fire to crackle loudly and emit the sparks we see amidst the smoke. Juniper was believed to enhance the protective function of the fire throughout the night, as it was believed that other-worldly beings such as witches were particularly active on Midsummer Eve. 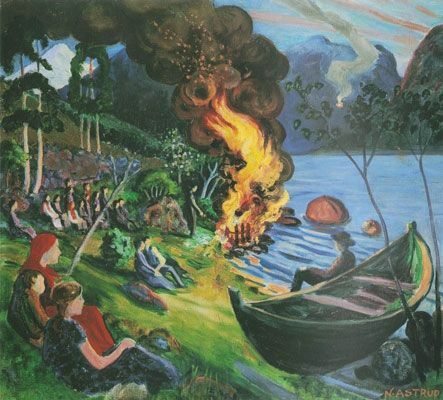 Astrup created several versions of the Midsummer Eve scene. Although in this version, the spectators sit and watch quietly, in other versions they participate in lively dancing and music-making (such as fiddle-playing), as music and folk dancing were also important aspects of the Midsummer Eve celebrations. Astrup created these images from a vivid and troubling childhood memory. He later wrote in an undated letter to Mayor Aslaksen of Arendal in which he recalled "it was sinful for Christians to join the [pagan] celebration. Then [...] I had to stand back behind the fence and look and listen while the others danced around the bonfire and whooped for joy [...] It struck me that the bonfire was something sinful, something bad being practiced in the green dusk - it was pagan. This idea was reinforced by the jealousy festering inside me when the other children could attend, but I had to stand behind the fence." 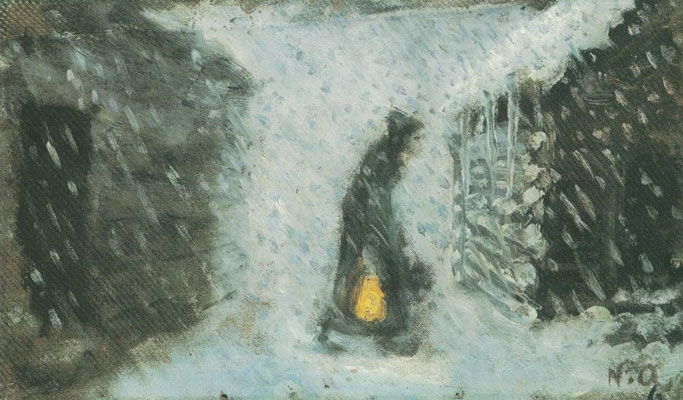 Art critic Claudia Massie noted of this picture, arguably his great masterpiece, that as "a Christian child, Astrup was forbidden to participate in these rituals. Instead, he had to watch, simultaneously seduced and scared by what he saw [...] This conflict is evident in the work. Astrup is an observer, not a participant, and what might in another artist's hands be a glib, gleeful scene becomes something profound and unnerving; the prelapsarian seen through the pastor." Artwork description & Analysis: As far back as 1901, whilst studying in Paris, Astrup had taken an interest in Japanese woodcuttings. 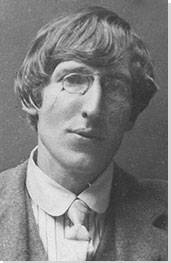 But it wasn't until 1914 that he started to focus more seriously on producing his own woodcuts. The title of this work, Seljekall (meaning "the call of the Selje, or goat willow tree"), refers to the whispering sound made by the wind as it blows past the Selje tree. Astrup renders the "calling" tree as a Troll clawing at the sky. At the centre of the tree we see a round head-like shape with protrusions that look like ears, and on either side of this, arm-like branches each with five "fingers" reaching upward. The tree is silhouetted against a natural background (a lake with mountains beyond) rendered with light pastel colors. As Massie explains, Astrup's notebooks contain "descriptions of funerals, many references to the sickly or 'poisonous' colors he sees in water, marsh or rising from the evil spirit of a herd of swine and, of course, there are musings on trolls. 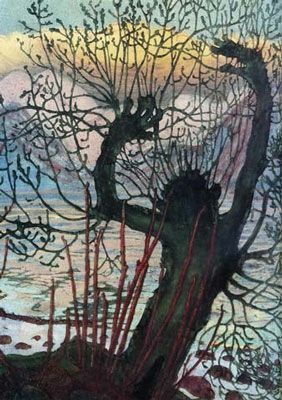 These mythic beings have a mighty hold on the Norwegian psyche [...] Astrup pruned his trees to resemble trolls and made paintings of these tortured creations. It is a curious motif, at once atavistic and twee, the heightened imagination of the child carried into adulthood." With this woodcut Astrup reveals then a somewhat ambivalent relationship with his surroundings: at once calm, serene, dark and menacing. Artwork description & Analysis: In the foreground of this late career painting, a woman on the right-hand side wearing a blue and white patterned dress, with her dark hair gathered at the nape of her neck, stoops over in a garden gathering stalks of red rhubarb. To our left, a blonde child in a dark cap and coat kneels at the edge of the garden with his hands in the dirt. Beyond the figures our eyes find cherry trees in blossom, and a white picket fence that follows the slope of the grassy green hill downward. On the other side of the fence are blossoming apple trees, and snow-capped peaks. But the brushstrokes used for the apple trees are less defined than those for the trees and plants within the garden, asking us to restrict our focus to within the garden. 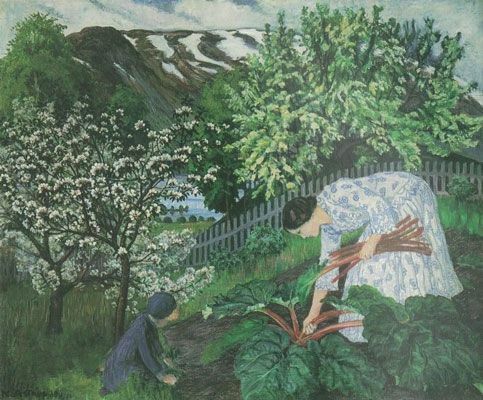 This is one of several works completed by Astrup (including Spring in Jølster (1925)) that feature the garden of his family home in Sandalstrand. He and Engel had built up their property from a few dilapidated structures into a proper home and working farm where the couple and their eight children could live off the fertile land. It is now a working gallery and permanent home to Astrup's legacy.